After heart disease and cancer, the stroke is the third leading cause of death in Germany. Even if the stroke does not lead to death, it can have far-reaching consequences. 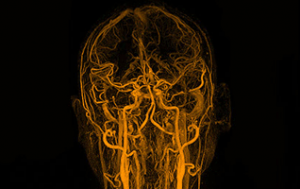 With a check-up using MRI (magnetic resonance imaging), we can image your brain as well as the blood vessels supplying the head and the neck. This means we can detect irregularities in the vessel walls, constriction (stenosis) and the first signs of inadequate perfusion of the brain tissue in good time and provide treatment where appropriate. Who should have a check-up? The examination in the state-of-the-art magnetic resonance imaging devices is completely painless, does not require X-rays and takes approximately 30 minutes. For some check-ups, depending on the specific circumstances, a gadolinium-based contrast agent is injected into an arm vein. With a check-up using MRI (magnetic resonance imaging), we can image your brain as well as the blood vessels supplying the head and the neck. This means we can detect irregularities in the vessel walls, constriction (stenosis) and the first signs of inadequate perfusion of the brain tissue in good time and provide treatment where appropriate.